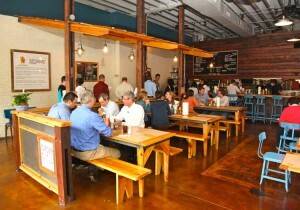 Diners place an order along the left side of Farm Burger, then grab a seat at a communal table. The blue metal chairs along the right give the restaurant a grandma's kitchen kind of vibe. Photo by Sara Hanna. Perhaps it’s a good thing we live kinda far from Decatur and there is no real way to sanely go east to west in this town. 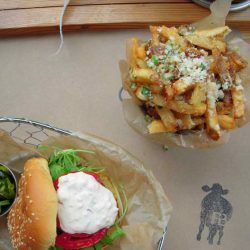 Because if we lived closer I’d be permanently parking a rapidly spreading behind on a bright blue metal chair at Farm Burger, rising only to put in another order for fried Georgia okra and beer-battered onion rings. I loved everything about Farm Burger, from their juicy grassfed burgers to their plethora of toppings to their farm-inspired-but-not-cheesy decor and serving pieces. We’ve been talking about going back every since our first trip this summer. Farm Burger is the kind of place we always mean to go but never quite get there, but a friend’s opening at an art gallery provided a perfect excuse to pile both kids and my son’s girlfriend in the car and make the trek to Decatur. We happily discussed the menu while we waited in the fairly long, ever-present line. We got a kick out of the photos of the cows and read about how Farm Burger uses seasonal, local produce and sources its meats primarily from Moonshine Meats. A burger and fries at Farm Burger. Photo by Kristen Bach. The chef, Terry Koval, worked with Gary Mennie at Canoe for three years, then joined Concentrics Restaurants where he worked as sous chef at Lobby at TWELVE, then became Executive Chef of Room at TWELVE. Somehow I believe his personality and tattoos, which include silverware, a pig, an egg in a skillet and the Morton salt girl, are more at home in this relaxed atmosphere. But let’s talk about food. I really needed that wait in line to decide between all the possibilities. You can select from one of six Blackboard Burgers, which range in price from $7 to $10 and include ingredients such as Gruyere cheese, carmalized onions, Georgia pecan pesto or house-marinated mushrooms. Or you can build your own, by starting with the $6 burger and adding from a list of free, $1 or $2 ingredients. Sides include hand cut fries, sweet potato fries, beer-battered onion rings, just to name a few. I went fairly basic, with toppings of house pickles, tomato and Wisconsin cheddar cheese. After grabbing a table in the very crowded dining area, we admired the cow-stamped placemats and grabbed the silverware stored in mason jars. Our burgers came in baskets with the fries served in little tins. We all loved our burgers, which are also antibiotic and hormone free, and had a lively discussion about which was best among the sides. It was close to me, but the whole fried okra won my heart. Drinks include a very short wine selection: three whites and four reds and a small selection of beers, including locally produced ones such as Terrapin Rye. I had a major flashback to college when I saw the Adult Float, made with beer. When we were freshmen in college we had a keg at our dining hall every Friday. I am not making this up – back then we could drink at 18. One of my suite mates Laurie, delighted herself and disgusted us by her weekly consumption of beer floats. The only worse concoction I’ve heard about was the writer Tom Robbins, who swirled up a drink made with gin and mayo, the only items in his fridge. Another thing I love about Farm Burger is that the restaurant offers ethically produced food affordably. You can get an amazing burger for just $6. And check out this lunch special – burger, fries and a drink for just $8. So while you may feel guilty about the calories here – fried okra is not on anyone’s list of healthy low-cal items – you don’t have to feel bad about the price.